Pair of linear and simple armchairs in the architecture of their design, of the middle of the century, they are made valuable by simple tricks but very well finished. The structure of the seat and backrest are covered with a fine white velvet fabric; while the structure of the leg and of the armrest, is linear fine and well-shaped, and is lacquered with black shellac. The seat and legs are held together by four brass screws, two on each side. The four legs also in the lower part have brass inserts, which embellish and reinforce the end of the leg. Finely restored in te wood and brass polishing part, a white fabric was chosen in contrast with the black of the legs. A pair of French midcentury beech compass style bridge / desk armchairs. 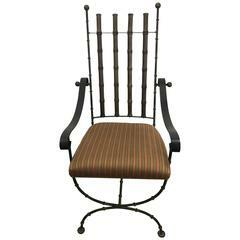 Classic Regency Modern faux bamboo, wood and brass armchair. Matching desk or wine tasting table available, check other listing. A pair of French midcentury beech bridge armchairs. Measures: Arm height is 26 3/8".